The Lucas Gates band is among the hottest bands in the NW region, with a long list of venues across the four-state area. Performing at the highest standards of entertainment, their range of music includes Country, Classic, Rock, Blues, and a long list of other genres that are sure to keep you entertained. When John set behind a drum kit for the first time at the age of 5 he was hooked. At the age of 18 he went on tour with Centrefire. With 30 years of experience under his belt he decided to start his own group. 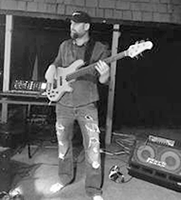 With influences like Restless Heart, Huey Lewis And The News, Journey and Carter Beauford, John brings a solid backbone to the rhythm section of Lucas Gates. Starting the group in 2013, this band has the experience, talent and versatility that he had been looking to create since its infant stages. As the last chords of "Honey(Won't You Open That Door) rang out, the love of singing honky-tonk music had begun for 2 year-old JR. From that moment, music has been a shaping force in his life. Singing was his sole focus for the next 13 years, as he was influenced by everyone from Garth Brooks to Merle Haggard to Boyz II Men. At age 15, his life was changed forever by the gift of a guitar. Again, a plethora of influences from B.B. King to Merle Haggard to Eric Clapton to Angus Young to Brent Mason have shaped his playing and his guitar tone for the last 20 years. JR has been with Lucas Gates since July of 2015, harnessing all of these influences into a style that's honky-tonk, blues, soul, and rock-and-roll all in one. Starting on drums at a very young age, Zach Amey began to develop a love for playing music. At the age of 8, he discovered the guitar. With influences like Keith Urban, Tim Amey, John Mayer and Stevie Ray Vaughn, Zach began to mold his musical style. After playing in a high school rock group, Zach joined The Stonehorse Band at the age of 19 playing drums and guitar. Zach’s unique approach to playing adds a whole new element to the band along with harmonies and a great lead vocal, he is a perfect fit for Lucas Gates. Larry Brown started his musical venture at the age of thirteen. Following the tradition of his grandfather and father before him, Larry picked up the guitar and started learning to play. At the age of 13, Larry sang his first song in front of an audience at the local church he attended when his mom made him get up and sing against his will. For the next 7 years Larry began to develop his musical style and found the love of bluegrass music which led him to his next 13 years of playing bluegrass all over the 4 state area. Developing strong lead vocals, harmonies and an ear for rhythm he was a perfect fit for Lucas Gates joining the group in March of 2017.